Here’s something to look forward to for MindManager fans. I saw a brief preview of this earlier this year, but otherwise haven’t had a chance to look at it yet. I will be upgrading as soon as I can get my hands on a copy. Thank you to Chuck Frey for his excellent summary post on the upgrade. Ribbon style toolbar: With MindManager 7, the developer has adopted the Office 2007 style of “ribbon” toolbar. It’s well designed and easy to use, and exposes more of the tools you need to create and manage maps, without being overwhelming. In other words, the developers at Mindjet did a very good job designing this toolbar, from a usability standpoint. One thing that took a little getting used to was the location of the text formatting tools. Formerly located along the bottom of the MindManager workspace, they have now been moved into the ribbon toolbar at the top of the workspace. Saving queries and views: I haven’t used this feature yet, but I think it’s going to be an important one for MindManager “power users.” You can now save a set of match criteria used by the Power Filter, Power Select, or Power Bookmarks commands for later re-use. Nice! Focus on topic: This new command automatically centers the currently-selected topic in the workspace, and collapses all other map branches. This enables you to quickly focus your thinking on that part of your map, and minimizes other distracting content. Tighter MS-Office integration: The “insert” menu now enables you to create new Outlook tasks, appointments, contacts and notes, from within a MindManager map. Clicking on the task toolbar button, for example, opens a new Outlook task dialog box. When you’re done typing, you click save, and the task is automatically added both to your Outlook task list and as a topic in your map – very slick! You can also do the same thing with a range of spreadsheet cells using the Excel range toolbar button. Map styles: MindManager 7 now offers an expanded selection of map styles, which incorporate different styles of topic lines, color schemes and more. The styles give users a pre-formatted, time-saving set of attractive styles to choose from. This should be particularly appreciated by new users of the program, who may otherwise find making such map-level changes daunting at first. Improved formatting options: In the formatting tab of the ribbon toolbar, MindManager 7 now includes options for changing the spacing between sibling topics. You could do this in previous versions, but it required digging down through the program’s menus and making these adjustments in a dialog box. Now, you can click on increase and decrease spacing toolbar buttons, and immediately see the impact on the appearance of your map. In addition, the new version of MindManager now offers a “format painter” similar to the one in Microsoft Word. More topic sorting options: In MindManager 7, you can sort by alphanumeric order, alphabetic only, on task percentage complete and task priority. For added flexibility, you can also choose the sorting “depth” – subtopics only, the entire sub-tree or to a level that you specify. In addition, you can select from a forward or backward sorting order. Topic styles: MindManager 7 now enables you to create named topic styles, based on the format of the currently-selected map topic. This is a time-saving feature that will enable you to quickly reformat the appearance of your map topics to meet your needs. It’s similar to the way in which you can create named topic styles in Microsoft Word, where each one “remembers” a particular set of fonts, colors, sizes and text styles, and can be applied with a click of the mouse. Icons and map markers: These visual elements can now be added from the ribbon toolbar, which is faster than opening a panel on the right side of the workspace and then selecting what you need, as in previous versions of MindManager. You can still access this type of window, but what’s significant is that the program’s developers now provide you with a streamlined way to add them to your map. While previous upgrades to MindManager have been incremental, version 7.0 is clearly a bigger leap forward. The ribbon toolbar really does enhance usability by putting more tools at your fingertips. In addition, Mindjet’s developers have added a significant number of new features that make the program easier to use and make it more powerful for managing large amounts of information. MindManager 7 will be available in Pro, Lite (a basic version for home/education users) and Mac versions. For more information, please visit the MindManager 7 page on the Mindjet website, where you can register to be notified when the program is available for purchase. Click here to view today’s news release announcing this significant new visual mapping product. 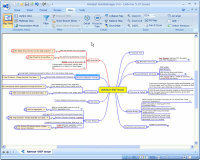 This will be interesing to see what they have come up with – I tried out Mind Manager before choosing to go with NovaMind – they have had the ribbon bar for I guess at least 6 months – I really like NovaMind – great looking Mind Maps. — Subtopic-A is has the marker “Task Done” set in MM 6. — Subtopic-B is “sent to Outlook” then marked complete within Outlook 2007. — MM is “refreshed” and Subtopic-B shows up as completed inside MM 6. Thanks for any advice you can shed on this. I may upgrade if necessary. I upgraded to MM8 when it was released. I don’t know how to handle this particular scenario. Have you tried the support forums at MindJet?